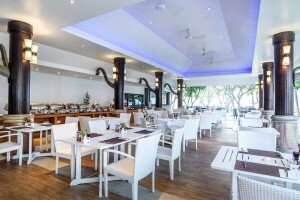 Novotel Samui Resort Chaweng Beach Kandaburi is an elegantly designed Thai-style beach resort located at the Northern end of Chaweng Beach, near the hustle and bustle of Koh Samuis entertainment center. The 183-room hotel is split into the Hillside and Beachside zones by a narrow road, with the shallow waters of the bay at its doorstep. Leave your worries back home and let us pamper you with a welcome drink on check-in. Start your relaxing day with a massage at Kanda Spa or by the poolside, with a fresh coconut juice by your side. Continue with an authentic Thai lunch prepared with the freshest ingredients at @Beach Restaurant & Bar or Palm Court restaurant. Enjoy happy hour with a stunning view of the Gulf of Thailand and dine under the stars to the rhythm of the swaying palms trees and soft waves. The next day, start your morning with a sumptuous buffet breakfast including Thai, Asian, and international favorites… and repeat! Traditionally home to a small community engaged mainly in fishing and harvesting coconuts, there were no roads in Koh Samui until the 1970s. Today, it is easily accessible thanks to its international airport welcoming flights from all over Asia and the rest of the world, though a short connection in Bangkok. Ko Angthong National Marine Park or bathing at Namuang waterfalls, to shopping at the island’s various traditional markets. If you’re interested in culture, don’t miss visiting Buddhist shrines such as Wat Phra Yai, Wat Khunaram, and Wat Plai Laem, and catch a stunning sunset from the famous Big Buddha Temple. Unveil the secrets behind Hin Ta and Hin Yai and the Secret Buddha Garden, only some of the many must-visit spots on the island. Novotel Samui Resort Chaweng Beach Kandaburi is part of the exclusive MyResorts program, that provides rewarding resort experiences for Le Club AccorHotels members. Book direct on AccorHotels.com to get more benefits.